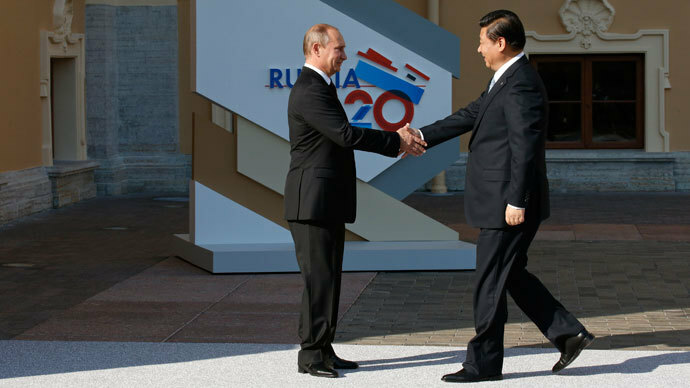 China joined Russia in its opposition against military strikes on Syria ahead of the G20 summit on Thursday. Beijing said the use of force would cause a swing in oil prices, thereby hurting the global economy. “Military action would have a negative impact on the global economy, especially on the oil price – it will cause a hike in the oil price," China’s vice finance minister, Zhu Guangyao, said at a pre-G20 briefing in St. Petersburg. The remark was echoed by other members of the BRICS bloc, Reuters reported. Aside from China, the bloc consists of emerging economies including Brazil, Russia, India, and South Africa. Beijing and Moscow have a “very similar position” on the use of force against the Syrian government, spokesman for the Chinese delegation at the G20, Qin Gang, told RT. Both nations are “appealing to the countries concerned, to be serious about the possible consequences on the use of military means without the mandate of the UN Security Council,” he said. “The facts have shown in recent years that military means can’t solve a complicated issue like Syria. On the other hand, military means may cause even more serious humanitarian problems in the region,” Qin explained. According to Qin, China’s leadership views a “political consultation” as the only way out of the “tragic situation” in Syria, where the country’s civil war has taken over 100,000 lives over the past two-and-a-half years. China has spoken out against military action despite being briefed by the US on Monday regarding Washington’s evidence that Assad’s forces were behind a chemical weapons attack which took place on August 21. Despite the G20 summit being a purely economic forum, Syrian conflict discussions became the focus of Thursday’s working dinner, during which UN Secretary General Ban Ki-moon thanked Vladimir Putin for giving him the opportunity to address world leaders on the issue. Putin allowed the issue to be discussed, acknowledging the impact that it has on the world economy. Barack Obama is seeking approval in Congress for the “limited” use of force against Syria, as the US claims to have evidence linking Assad’s government to the use of chemical weapons. Russia says the US should present its proof to the UN Security Council. Otherwise, any military action without a UN mandate would be a violation of international law. The Kremlin believes that reports of chemical attacks are a “provocation” by Western-backed Islamist rebels, claiming it is illogical for the Syrian government to use toxic gas against its own people. Both Putin and Obama will use the G20 summit to promote their views on the Syrian conflict, Russian presidential spokesman Dmitry Peskov told RT’s SophieCo program.